Botanical Garden of Angers : This park was the first botanical garden on the boundary of the town, at the end of the 18th Century. Saint-Samson's church, dating from the 12th Century, served as an orangery in the 19th Century. Today the garden, which is next to Place Mendès France, allow us to appreciate the countryside atmosphere created by Edouard André. This 4 hectare area demonstrates an 'English Garden' style, dating from 1901. The footpaths, waterfalls, ornamental ponds and statues give it a romantic atmosphere. 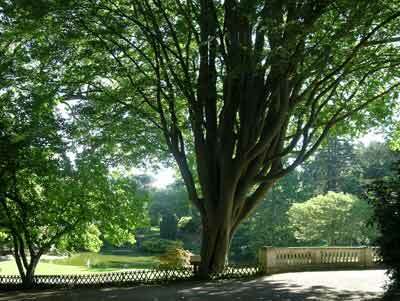 Full of history, the garden also offers the chance to stroll among an old and very beautiful collection of remarkable trees such as a Siberian elm (Zelkova), which was distinguished as one of the remarkable trees of France. This garden, which received and introduced the first ”magnolia of Angers” in 1792, today presents recent collections of peonies and camellias which decorate the flower-beds It contains also animal enclosures and aviaries. From 8.00 am to 7.00 pm from 16th September to 30th April and from 7.00 am to 8.00 pm from 1st May to 15th September.